What really happened when the impetuous young Alexander met King Darius III of the mighty Persian Empire in 331 BC? Who was the nineteen-year-old hacker who rewrote the rules of the Indo–Pak conflict? What strange facts must bestselling author Preeti Mishra confront when she collaborates with her deaf–mute sister Pari on a new novel? Combining history and fantasy, and cutting a wide arc through space and time, Talespin: Stories is a collection of stories unconstrained by convention. Here, hired killers, big game hunters and Mughal damsels entice you into their world, the sixteenth century meshes comfortably with the twenty-first, and the war of Troy seems as real as World War II. 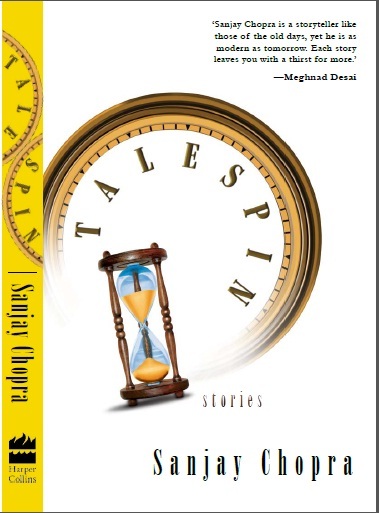 Sanjay Chopra’s vivid prose mythologizes history and makes believable the mythic. In the intrigue-filled world that he creates, the past and present conspire to ensure that the next spin is only a page away.